The machine-list file identifies all the machines on your network that can be allowed to batch process Harmony files. The machines on this list represent the render farm. NOTE: You must have sufficient batch processing licenses to run batch processing on all the machines in the machine-list file. IMPORTANT: Make sure the Cisco OpenH264 codec is installed on all the machines that will do the batch render of movie previews—see Configuring Harmony Web Control Center on Windows, Configuring Harmony Web Control Center on Mac OS X and Configuring Harmony Web Control Center on Linux. In Windows, use the Harmony Configuration Wizard to add computers to the machine-list file and to install the batch processing service. 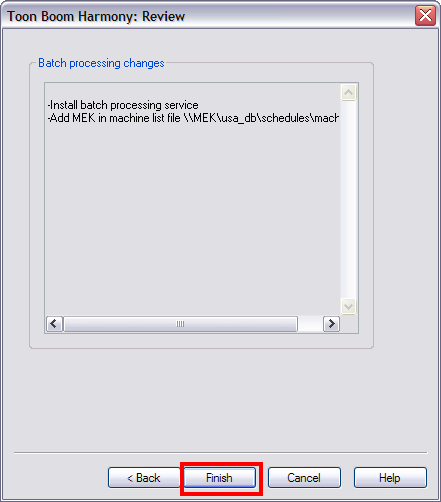 You must run the Configuration Wizard on all machines that will perform batch processing. 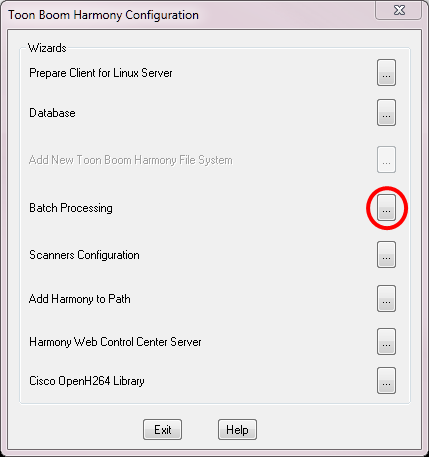 In the Harmony Configuration Wizard, click Batch Processing. In the Batch Processing screen, select the Yes option to have your computer perform batch processing. Click Next. 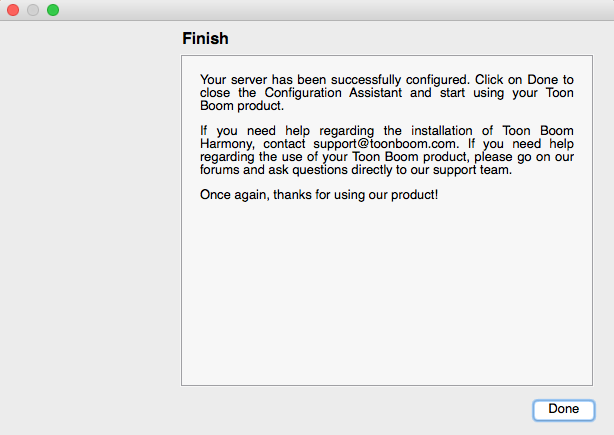 In the What is the Name of the Server field, enter the name of the Harmony server. 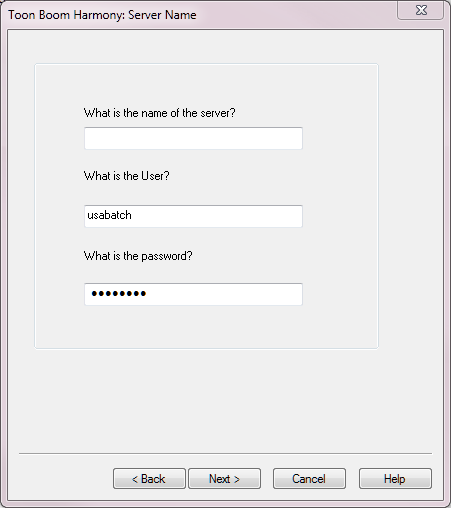 In the What is the User field, enter the server's user name (OS account) created while setting up the Harmony database. The machine you are setting up will use this user name and password to log on the server machine and retrieve the data to render or vectorize. In the What is the Password field, type the password corresponding to the selected user name. The Harmony Configuration Wizard presents a review of all the changes that will be made. On Mac OS X, use the Configuration Assistant to install the batch processing queue Startup Item that will start the batch processing service. You must run the Configuration Assistant on all machines that will perform batch processing. 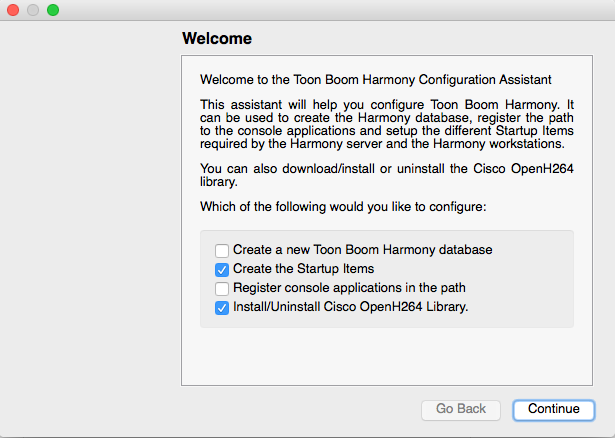 In the Finder, go to Applications > Toon Boom Harmony 12.2.1 [edition] > Tools > Configuration Assistant. Select the Create the Startup Items option and click Continue. 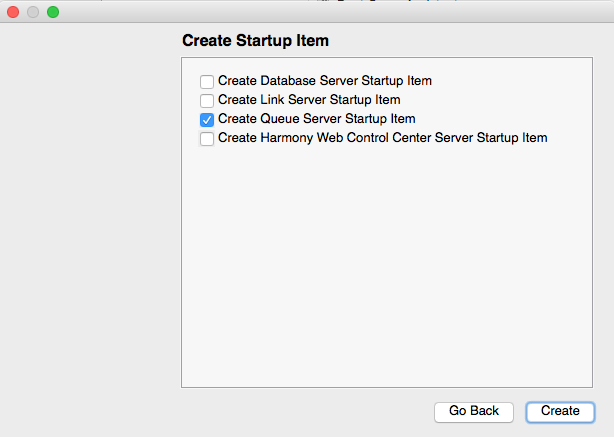 Select the Create Queue Server Startup Item option and click Create. 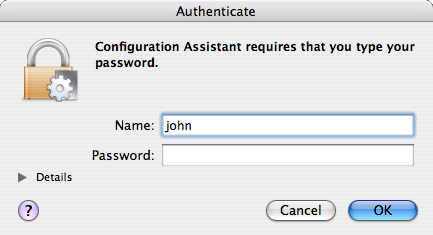 The Authenticate dialog box appears asking for a user name and a password. Type a user name who is allowed to administer the computer and click OK. The necessary files to automatically start the batch processing queue on the counter are copied. Repeat these steps on all the computers that will be performing batch processing. A dialog box appears to indicate if the Startup Item was successfully created. Click Done to close the Configuration Assistant. The machine-list file identifies all the machines on your network that are allowed to batch process Harmony files. The machines in this list represent the render farm. You must have sufficient batch processing licenses to run batch processing on all of the machines in the machine-list file. In a text editor, create a new text file. In the new text file, enter all the machine names in your render farm. The order that you list machine names determines their order in the batch processing scheduling commands. IMPORTANT: There must be no blank lines in the machine-list file. Save the file with the name machine-list in the /USA_DB/schedules/ directory. In the Script Editor, you should have a TB_WebCC_render.js script, which is installed when you create the web server. For previous versions of the Harmony database, it must be added manually. From the Script Editor view menu, select File > Import Script. The Save Script window opens. Choose a location in which to save the script. We suggest Global so the script is available for any user, environment or job. In the Script Manager dialog, in the File column, select the TB_WebCC_render.js script. If you keep the database that was created with an older version of Harmony, note the comp.dict file is not updated automatically when you install the latest version. You must manually replace the file with the latest version by taking the file from your local installation. Paste the file in usa_db >dicts folder, replacing the old comp.dict file.